Quality Koi fish delivered to your door! These beautiful fish can easily reach 36" in length and are available in a variety of patterns and colors. 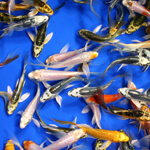 In addition, Koi are also available in Standard or Butterfly varieties. While Standard finned Koi fish remain the industry standard for top Japanese Koi shows, Butterfly Koi - which have longer more elaborate fins, are actually more popular among hobbyists. The perfect Koi for your novice or inexperienced pond customers. Available from 3 to 4 inches. The highest quality Koi that we have to offer, Premium Select Koi are hand picked from our one-year old crops and then given another year to grow. These are the absolute highest quality Butterfly Koi that we have to offer, and are some of the highest quality long-fin Butterfly Koi in the world. Available from 4 to 5 inches.